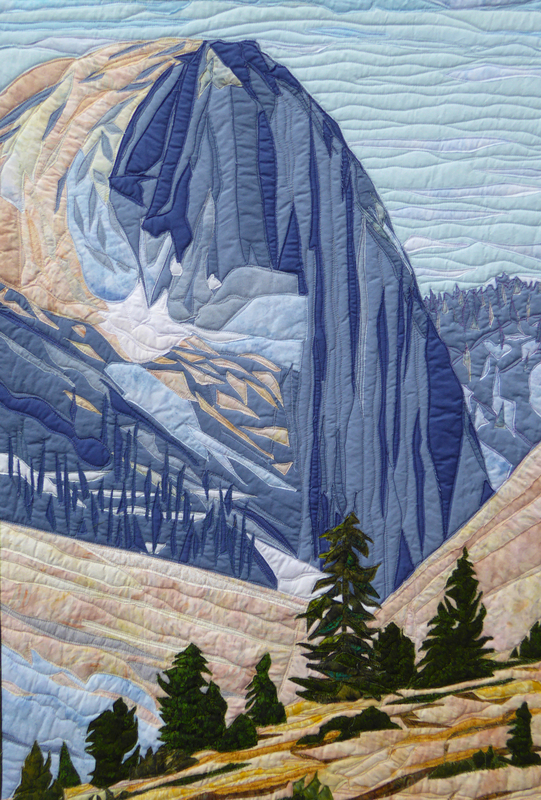 Yosemite Renaissance has selected Steeper to be in their 32nd exhibition at Yosemite National Park! What a great way to end 2016! It’s a tall piece, so if you can’t see the whole thing on your screen, click on the picture to bring up the full view. Yosemite will always be dear to me because I used the park some years ago to regain my confidence in hiking abilities after a broken foot and nerve issues that ensued. I will always be grateful the park was there to boost my morale. The Renaissance helps mark my ventures into national art exhibitions with landscape fiber art. I had an idea of my style before I achieved it and when it starting coming through in my work, it was time to act. It felt like a steep climb from quilt venues to all media art exhibitions but the reward of being juried into multiple national art exhibitions is akin to reaching the top of Nevada Fall. It keeps me wanting to do it again! So I seek out natural views when I can, and in my mind I am pulling the right fabrics out of the stack for new landscapes. Thank you to the members of Yosemite Renaissance for continuing to offer opportunities to artists of all media to compete!